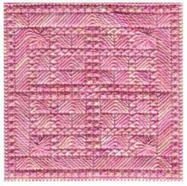 Needlepoint patterns with a variety of textural stitches, such as rhodes stitch, are what we are looking at here. Throw in gorgeous over-dyed threads and you have Textures to Dye for! If you want to have fun with the stitches but aren't confident enough to use tapestry canvas then why not stitch these needlepoint tapestry patterns on Aida instead? 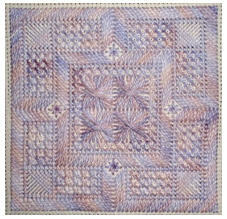 Each pattern comes complete with diagrams of the basic needlepoint stitches and full instructions. But that doesn't mean every pattern stitched will look identical. 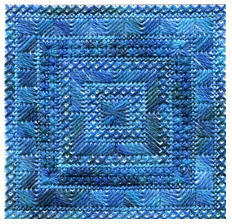 Take a look at some student pieces from my workshops and see what a difference the choice of thread makes. Using smooth stitches next to bumpy ones, shiny thread next to matt, large stitches against small ones, thick threads near to fine fibres you will achieve a tactile piece of work that everyone will want to touch. At just 3.6 inches square these little projects could be used for all kinds of things. My students have finished them as pincushions, needlebooks, and even stitched a number of them together to form a sofa cushion. What will you make them up into? Buy the Bundle and save money! You can buy the charts individually lower down the page, or use the button just below to order the whole bundle for just £12 (a saving of £3.75 so you are almost getting two FREE! 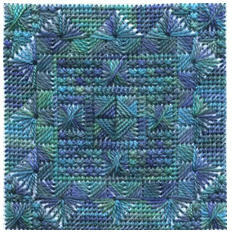 This pattern uses: cross stitch, smyrnas, slanted gobelin, rhodes stitch, fan stitch and leaf stitch. 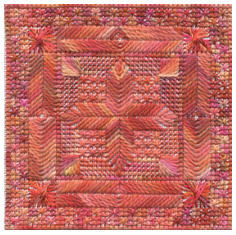 Stitches used in this design include: oblong cross stitch, smyrnas, tent stitch, alternating scotch stitch, cushion stitch and rhodes stitch. This time practice two sizes of cross stitch, mosaic stitch, rococco (or queen) stitch, slanted gobelin, diamond eyelets, rhodes stitch and tent stitch. 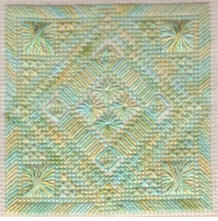 Needlepoint stitches used are: two sizes of cross stitch, slanted gobelin stitch, diamond eyelets, rhodes stitch, rice stitch and crossed corners stitch. This time we use the following basic needlepoint stitches: two sizes of cross stitch, smyrnas, slanted gobelin, alternating scotch stitch and rhodes stitch. 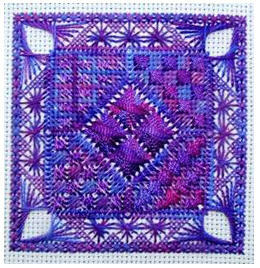 Use these needlepoint stitches in this pattern: two sizes of cross stitch, smyrnas, slanted gobelin, alternating scotch stitch and rhodes stitch. Lots of new stitches in this needlepoint pattern: rhodes diamond, mosaic, cashmere, alternating scotch, tent stitch, smyrnas, cross stitch, rhodes heart and amadeus stitch.